Note that the word “culprit” is used to describe white men refusing to watch the NFL. “‘So, in a sense, the NFL’s viewership/popularity problems seem to boil down to a problem with white men,’ NBC News noted” in reporting their poll. Uh, I know what they mean, but that’s not the way to write this. White men are not the “problem.” The NFL has the problem, and white men are determining — some of them — that the NFL is no longer what it once was. But this is clever journalism. You see how this is written? This is NBC News reporting on their own poll. “So, in a sense, the NFL’s viewership/popularity problems seem to boil down to a problem with white men.” Now, you might think I’m being overly analytical. No, folks, you have to put these in context. Are there not stories each and every day that the problems in American culture can be traced back to white men? This is just the latest example. Subset of white men is white Christians, and then a further subset is male and female white Christians. But, I mean, they are the targets — they are the focus — whenever there is criticism of intolerance. What they really trying to say here? What they want their readers to conclude is that white men, who used to love the NFL are no longer watching it because they’re a bunch of intolerant bigots who are not willing to accept the modern evolution of the culture of the NFL. And so we have an entity that is losing its audience, and the problem is the audience, and the audience is intolerant. Now, does that not fit with a consistent portrayal of white men, white women, white Christians that we have been treated to for the last seven or eight years intensely? “White Men Are Huge Reason for Decline in NFL Interest” is the headline. Okay, you can make a case that the headline’s accurate. I could make a case the headline is not trying to play games. “NFL’s Audience Decline Traced to Lagging Interest in White Men.” At least the problem would be pegged to the NFL. Right now, this whole story is blaming white men, blaming the audience, blaming the customer. So this is written in such a way that it’s not gonna result in anything getting fixed. So this is ultimately going to be portrayed as the NFL making a brilliant marketing move by angering its No. 1 fan base. It won’t be long before some Drive-By sports liberal gloms onto that angle and credits the NFL for really being brilliant in its foresight. “Why, the NFL knew all along what it was doing allowing those protests! It was getting rid of the audience that nobody wants anymore!” You wait. You’re gonna see stories like that be, and it isn’t gonna be long. This is the first one. Drew in Lafayette, Louisiana, great to have you, sir. How are you doing? CALLER: Great, Rush. Bayou Bengal dittos. This assertion that there’s some sort of racial component to explain the drop in the NFL popularity, if there is a racial component, how does that person explain the popularity of SEC football. The most conservative white males in the U.S. are in the South, and yet SEC football, ACC football, Texas football, those stadiums pack a hundred thousand fans. CBS pays the SEC millions for a weekly game, and there are a high percentage of SEC football players who are African-American. So this racial-component excuse in the NFL is ludicrous because how do you explain the popularity of SEC football? It’s ridiculous. And, Rush, if you never made a night game at Tiger Stadium in LSU against Alabama or Georgia, you need to do it, because it will change your life. RUSH: That’s awfully kind, I appreciate it. I’ve been to one nighttime college — well, I’ve been to a couple Nebraska night games, but I was sitting in the corporate skybox up there. RUSH: Hey, I was invited. What am I gonna do? But I have been to one nighttime college football game in the stands when I was a kid. It was Mizzou-Arkansas. I know that’s nothing like Alabama-LSU, but at the time it was big. Mizzou won that night, and our hosts — my dad was a lawyer, had some clients down in Little Rock who invited us. They were in tears at the end of the game! They were crying. They were trying not to cry, they were trying to show us how tough they were. They congratulated us on the win, but they were crying. I remember enough about the atmosphere to know what you’re talking about. CALLER: Well, but Tiger Stadium is different, and I think everybody will say that, so make it down to Tiger Stadium for a night game, and I’m telling you, there’s nothing like it. RUSH: How do you even get in? I can’t imagine anybody — the students don’t even get very many tickets to these games, right? CALLER: Oh, no, the students have probably about 10,000. And they get there early, and you can tell it’s a big game because the aroma of bourbon kind of wafts across the field about an hour before kickoff so then you know it’s a really big game. RUSH: There is — (laughing) — there’s enough that you can detect the aroma? CALLER: — and all those other people say it’s the most unbelievable atmosphere in sports and you need to make the game. RUSH: All right. Well, I’ll put it on the bucket list. I appreciate it. I want to explain to people that may not have heard what you’re reacting to, there is an NBC News/Wall Street Journal poll today pointing out the NFL’s ratings problems are really not the NFL’s. 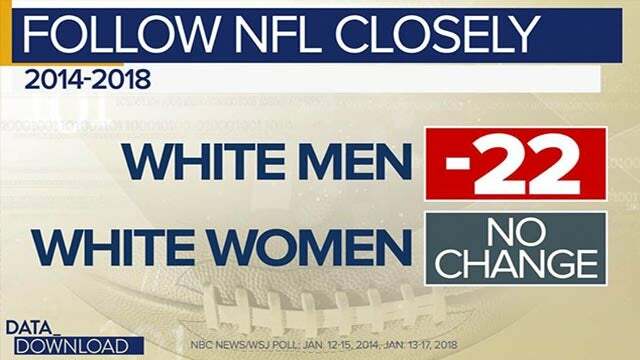 The number one demographic the NFL has lost is white men. They’re called “culprits” in this story, and they are blamed. The NFL is not cited as the reason white men are watching less of the NFL. White men are watching less — it doesn’t say this, but you can’t help but infer it — that white men have become a bunch of intolerant bigot. It’s related to the kneels, the kneel-down, taking the knee protesting the anthem and the flag. And it is clearly, this story and the poll is clearly meant to identify white men as being intolerant of that, and that’s why they’re watching the NFL less. But the way the story is written and the way the poll is reported, it’s not reported as a problem for the NFL. It’s not the NFL’s fault. It’s that demographic — and this word is not used. You have to know how to read these stories, folks, to understand the impact on your average low-information voter reading this stuff. The average low-information voter is going to think that the problem the NFL has is a bunch of intolerant old white guys who refuse to modernize and tolerate behavior and beliefs that are differentiate from their own. And if I’m right, it won’t be long before we see some stories praising the NFL for not buckling to the pressure from these aging white guys because the NFL’s future is not them. The NFL’s future is the young demographic made up with the rapper industry and so forth. And the NFL knew that it was gonna take it on the chin for a couple of years, but they had to make this transition. And they’re gonna be praised for not responding to the complaints of that demographic. And when that series of stories happens, that’s when you will know that my interpretation of this is right. I mean, you don’t have to wait for that. You can trust me now. But that will prove itself.